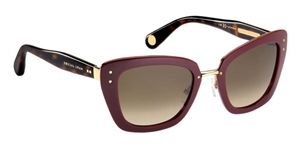 The Marc Jacobs MJ506/S 0NOJ6 is an elegant Burgundy like a fine wine this frame will only get better with age. A retro feel from the rounded catseye style to the mix of rich burgundy with the dark havana arms. The Marc Jacobs MJ506/S 0NO/J6 is an elegant Burgundy like a fine wine this frame will only get better with age.The frame is a playful twist on the catseye style famed from yeasteryear with delicate curves this frame is chic and a classic Marc Jacobs piece. Ageless stylish and quality. The frame has Marc Jacobs on the arms and the MJ insignia logo on the ends in layed in gold. The Lenses are a warm rose gradient. The Frame has a gold metal inner brow bar and nose pads for added comfort. All Marc Jacobs sunglasses are covered by the 12 month no quibble sendoptics guarantee, and come with their own case, cloth.